well, this one is for now. I can see areas (lots of them) for improvements but time to move on another still life. Today, I was looking after my young grand-daughter and normally that would be an excuse not to paint. However, I determined that housework, cooking etc could be deferred whilst Juniper slept and I could work on this during that brief window of opportunity. Wow, a break through for me! To be honest, it was not that brief as she is still at the longer nap stage at the moment. 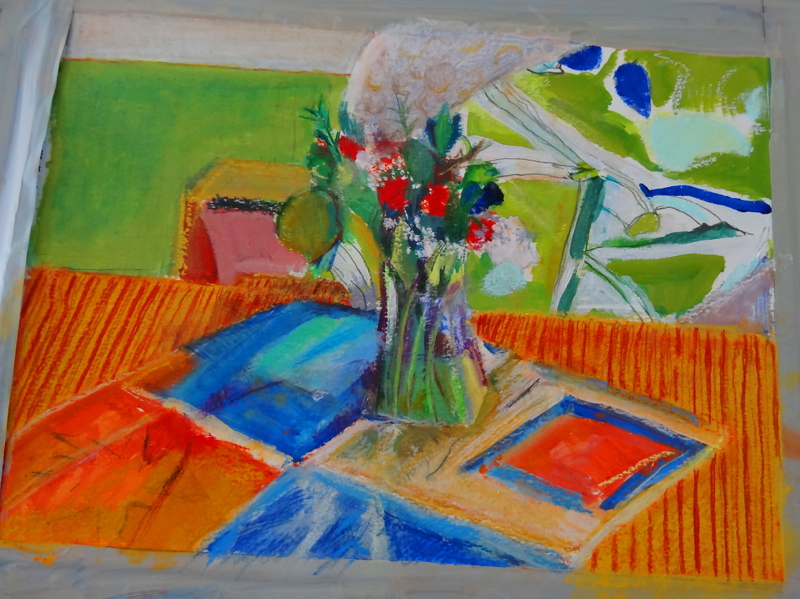 The one thing that I had been struggling with was the stripped material the still life was sitting on. As can be seen in the previous stages of this work I had been painting in the stronger colour and then attempting to put on the yellow/mustard colour. Totally the wrong way to do it and in sudden flash, decided to cover the red/orange completely with a yellow pastel and using a prismacolor pencil, drew in the stripes. I just drew them as I saw them, the perspective is all wrong I know but somehow it works. I worked on the problem area at the top of the painting, scrubbing in white, greys, reds, blues with pastels and pencils. It looks better but it still not quite right. looking at it at the moment, it definitely the large green area to the left that is the issue, more than that area. It lacks substance, maybe that is something I could work on. I also work on the flower arrangement itself and the material immediately below the still life. The flower arrangement is better but I could never get the shadows on the material to work. I just ended up with a rather ill-defined shape with no real body, it just float very badly. I added a few touches to the boldly patterned material in the background but not much as it seems to work apart from the odd triangle in the far right. Wow, looking this image on the screen and its way too bright. My camera really doesn’t capture reds well. Safe to say it’s not as bright as this image. Think I will need to invest in learning to use my husband’s DSLR. Photography is not my skill. Anyway, tomorrow, another life to create. This one is finished (maybe work on the bottom material) as the flowers are now too dead! This entry was posted in Uncategorized and tagged acrylic paint, caran d'ache II pastels, derwent aquatone pencils, Jacqui boyd alden 6th Jan 2014, Mixed Media, mungyo soft pastels, prismacolor, soft pastels, still life, strathmore watercolor paper. Bookmark the permalink. Well done Jacqui, I think the finished painting is lovely. Don’t touch it!